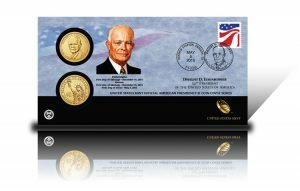 On deck for release later today is a new Coin & Chronicles Set honoring Dwight David "Ike" Eisenhower, the five-star general and 34th President of the United States. 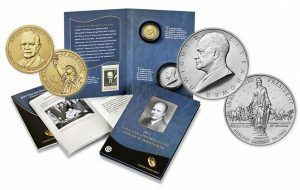 Featuring a reverse proof $1 coin, a silver medal and a 6-cent stamp, this 17,000-limited set for $57.95 is poised to sell out quickly. 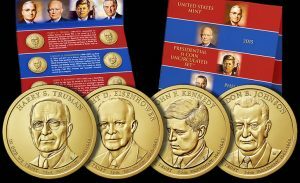 The latest collector product from the United States Mint, the 2015 Presidential $1 Coin Uncirculated Set, went on sale today for $16.95. 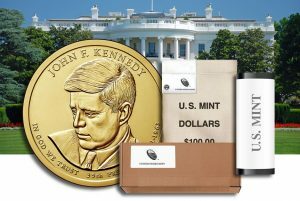 At noon EDT today, July 16, the United States Mint started accepting orders for new coin covers with two 2015 John F. Kennedy Presidential dollars. 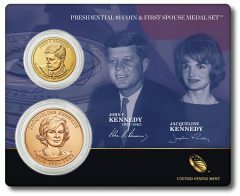 At noon EDT today, July 9, the United States Mint will release the latest Presidential $1 Coin & First Spouse Medal Set. 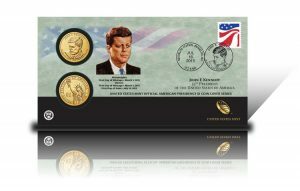 This newest issue commemorates John F. Kennedy, the 35th President of the United States, and his wife Jackie. 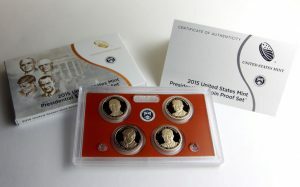 Today, May 12, the United States Mint released another installment in its series of Presidential $1 Coin & First Spouse Medal Sets. 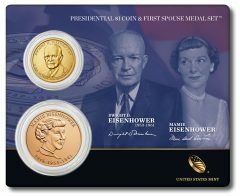 This new set honors the 34th President of the United States, Dwight D. Eisenhower, and his wife, Mamie. Today, the United States Mint started accepting orders for the new coin covers that feature 2015 Eisenhower Presidential dollars. Today, April 29, the U.S. Mint started taking orders for the latest addition to its series of Presidential $1 Coin & First Spouse Medal Sets. 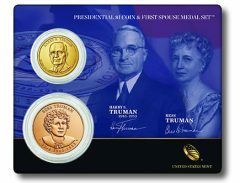 This new set honors the 33rd President of the United States, Harry S. Truman, and his wife, Bess. The United States Mint last week started selling its 2015 Presidential $1 Coin Proof Set for $18.95. This short article presents a photo overview of the set of four clad dollars which scored six-day starting sales 110,863.